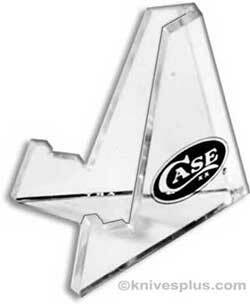 The illustrated Case Knife Display Stand is the Small Case Knife Display Stand that holds one knife horizontally. The Case Knife display features single piece acrylic construction with the Case Long Tail C logo. The Small Case Knife Display is 1 1/4" wide and 1 1/2" tall.